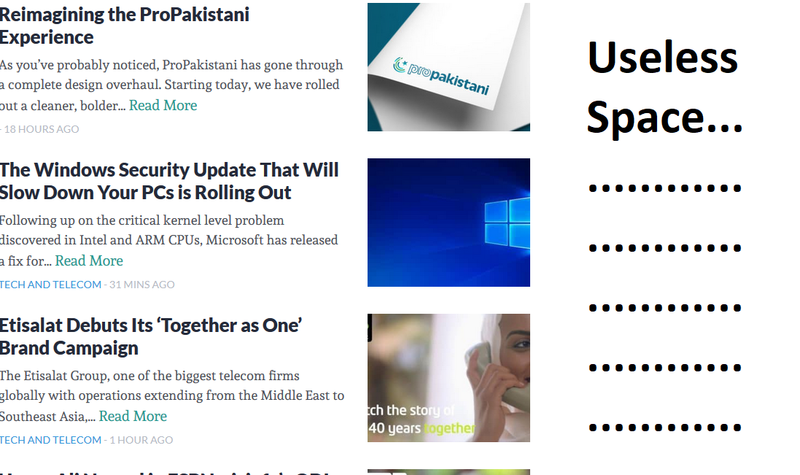 As you’ve probably noticed, ProPakistani has gone through a complete design overhaul. Starting today, we have rolled out a cleaner, bolder and far more modern design that was built on a content-first principle. Our goals were simple: create a distinct identity, emphasize on sections, improve engagement, and simplify the navigation. And after months of brainstorming and prototyping, we are finally unveiling the new ProPakistani to the public. The initial phase of any successful design process includes understanding the user. Apart from interviews and surveys, this is best done using careful analysis of site behavior data. Access to vital stats on Google Analytics is imperative to the redesign research. Traffic % from site (google) search queries? Average # of words in a search query? How many % of people click on sidebar recommendations? How many % of people click on main home page link in header? What were the traffic changes during last few redesigns? When the redesign was kicked off, we had a wide range of ideas and opinions about how the end result could look like. But one thing was certain, the design had to be simpler! The site was dissected into general elements and each interaction went through series of variations keeping the user in mind. For ProPakistani, we chose a modern slab-serif typeface with organic hints. Andada is a proven typeface that has received an award at the prestigious Ibero-America Design Biennial. For the titles, we wanted bold typography, and Lato makes a nice choice for improving the content impact. Andada paired with the classic Lato, makes a powerful combination that our users will absolutely love while browsing the site. For over ten years, we’ve been using a traditional green color which is quite similar to the one used in our national flag. Now, we’ve shifted to a more modern variant of green that has added shades of blue. ProPakistani has traditionally been known for tech and telecom. As frequently noticed (and pointed out) over the past year, we’ve expanded our focus to other niches. We’ve tested coverage in Auto, Sports, Aviation, Education, Career, Lifestyle and many more areas. Not only that, we’ve significantly ramped up our daily content from 5-10 posts per day to over 30. These dual changes have irked some of our long term users and we understand. That’s why we placed extra emphasis on ensuring everyone can get to the content they like without scrolling endlessly. Our new filters will help you quickly get to the niches you’re interested in while hiding the rest. If you want detailed coverage in a niche not listed in the filters, we’ve added them to the Others dropdown in our header bar as well. We placed extra emphasis on ensuring everyone can get to the content they like. With the new landing pages for categories and an easy way to filter out the content you don’t want to see, we’ll be able to bring in-depth and comprehensive coverage to everyone regardless of their preferences. ProPakistani is an evocative name and brand. The new logo captures this sentiment, our roots, our ethos of creating local content that matters, the affinity you feel with this brand and our collective passion for Pakistan. The icon is an amalgamation of the crescent and star from our national flag and a fingerprint. Our mission has always been to create a brand for the people, for each of you. The crescent and star represent our localized content, our shared love for our country and the fingerprint is the sense of identity and the individuality each of us bring in our mission to create a better Pakistan. We want you to know that ProPakistani represents the content you want to see, say the things you want heard and stand for values you adhere to and possess. Replace this fingerprint in our logo with yours and it’s the same thing. What unites us is our country and ProPakistani, as a brand, is me, you, it’s all of us. This revamp is a labor of love. Credits go to Ali Ashraf, a friend of ours who made this design from start to finish with great passion. The logo was created by the talented Shehryar Khan. It was developed by our in-house dev team headed by Maavuz Saif and Arbab Hassan, who stayed up many a night to make sure it’s faster, more responsive and sleeker than ever before. Over the next few weeks, we’ll be rolling out updates that will further improve user experience. Experiments and A/B tests will help us optimize the design in general. In addition, we’ve planned some exciting additions over the next few months which will make ProPakistani even more useful than before. Stay tuned for the updates, and feel free to let us know your thoughts (and any bug reports) in the comments below! Congratulations to the entire team on launch of new website, Propakistani has played an important in shaping eCommerce Industry. The design looks amazing, can’t wait to see the above listed features. Great Start from 2018 :) Thumbs UP to You!! Wish you Good Luck. Well done Team ProPakistani, I like the logo more ? looks cool. but should pro be the white and pakistani be green? Props for the new design, Ali and ProPK team. I really like this one. Keep setting the bar high! Amazing! Just wanna know how much did you spend to make it possible! It even looks great than Techradar and other leading websites of the world! @aamir7:disqus Mubarakaan to you and all your team! Nice choice of logo and Thumbs up for new color scheme and design. Where’s ProPakistani ki “Jaan”, Mr. Abdul Wahab? Congrats, Read more link was not working on tech-and-telecom featured post. I Think Comments Ka Font Size Chota Hai Bht! Congratulations to Aamir Attaa and ProPakistani team! I hope you guys will seize from sharing click bait news and upgrade yourselves. Finally a good design from a Local website, thumbs up team Propakistani. Finally, a proper LOGO . . . took 9 years to get here. ? Nice design; Simple, Elegant and clean! Congratulations on getting the blog overhauled. However, the font used in the logo could have been more better. Existing one doesn’t exactly give pro look in my opinion. Rest all great, great work guys and May Allah bless you with success in future as well! There is a lot unused space around articles. can be used for various purposes. Just my opinion. Its a good change. New year comes with new redesign. I love it. Keep up the good work. Very well done, a fresh new look of a trustworthy platform. Always keep Pakistan first. Wish you all the best. is that useless space reserved for ads. I was thinking the same. But 90% of the international magazines and blogs also have useless spaces on left and right. Awesome Design ? great work guys, keep it up ? you are running one of the most desired site of Pakistan ?? Congratulations. Design looks amazing and fresh. Okay, gotta hand it to you guys, this actually looks pretty effin awesome. A fresh start for a fresh new year. Was a nice surprise. Now let’s see if the quality of the content goes up as well. You guys have made and broken many promises in the past. Finally you have a good thing going, so better not ruin it this time please. Wow, just awesome design MashaAllah. Hard work is being reflected from your work. Very cluttered, over doing a bit….and how to get to older posts like in previous version??? pleasant upgrade and well written article, now its time to upgrade Wahab. 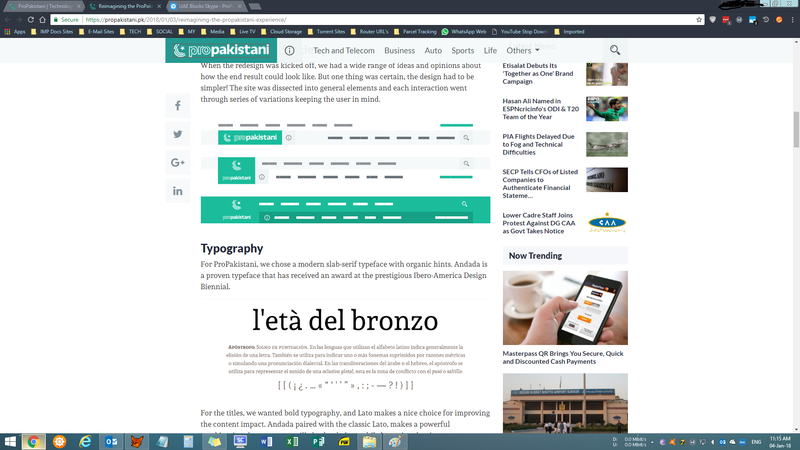 Add a calender type feature to jump to past articles quickly and please please introduce “read in urdu” too.